Cards That Never Were is a recurring series in which I create virtual trading cards for players who were missed in various sets. It is a concept I have borrowed from far too many others to list, but I appreciate all of them. Mark "The Bird" Fidrych was taken by the Detroit Tigers in the tenth round in the 1974 MLB draft. He made his debut for the Tigers in 1976, going 19-9 with a league-leading ERA of 2.34. He finished second to Jim Palmer, who went 22-13, in the Cy Young award race. His 1977 Topps rookie card is iconic. Fidrych is shown laughing with his curls flowing from his cap. It is one of my favorite all-time cards. It is simple, yet completely captures the essence of Fidrych. Unfortunately, things would never be this good again for Fidrych as arm problems derailed his promising career. He went 604 in 1977, 2-0 in '78, 0-3 in '79 and 2-3 in '80. He had multiple trips to the disabled list, as well as a couple stints back in the minors. 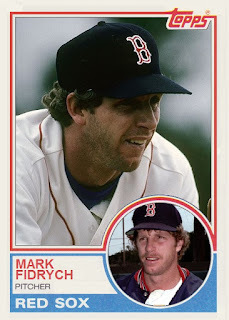 Topps gave Fidrych cards in every set from 1977 through 1981. His stardom and popularity probably helped him get cards despite some lean years. Fidrych pitched all of 1981 in the minors for Detroit, going 6-3 with a 5.75 ERA. The Tigers released him after the '81 season. It was a sad day all around for the Tigers, their fans, Fidrych and baseball in general. The Boston Red Sox signed him early in '82. He pitched in AAA for Bostonb in '82 and '83, compiling a record of 8-13 with an ERA of 6.63. That was the end of the line fo Fidrych. I completely understand why Topps did not give Fidrych a card in either the '83 or '84 set, but I that never stops me from creating virtual cards anyway. Fidrych never actually appeared in a big league game with the Red Sox, but if anyone deserves a little extra creative room, it is Fidrych. 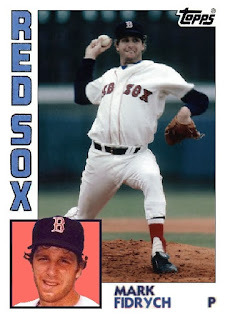 I went to the first game Fidrych pitched for the Pawtucket Redsox. Place was sold out that night. One of the happiest and saddest stories in baseball. Would have been great if he had made it back with the Sox. Fidrych would definitely be in my Top Ten of "Wished I met" celebrities. He seemed like a genuinely good guy.